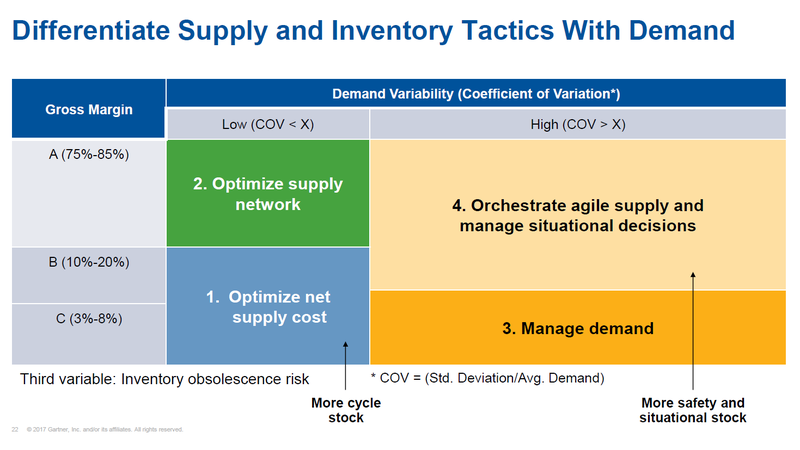 Gartner Research analyst Paul Lord has developed a thought-provoking approach (shown in the above diagram) for tailoring supply and inventory tactics to different inventory segments. Low margin (e.g., less than 20%) and low demand variability – Margins are very tight for these items, driving the need to minimize production and supply chain costs. At the same time, demand doesn’t vary much, allowing companies to “hard wire” their production and supply to churn out product at a consistent rate, maximizing resource utilization and production efficiency. Think of a bulk chemical manufacturer or oil and gas producer where the key is making supply chain and production choices that shave pennies or even fractions of pennies off unit product cost. Here Lord points out that companies can lengthen their production runs to reduce costs, allowing cycle stocks to increase. Cycle stocks can leverage economies of scale by using economically optimum supply quantities that minimize buying, making and shipping unit costs. High margin and low variability – In a way, these are ideal products. Lots of margin. Not too much demand variability. These are not commodities, but items with lots of margin such as pharmaceutical products. Rather than long production runs to drive down costs, the key is to optimize customer service. Strategic network design can optimize the supply network to address the range of supply chains needed to serve as many channels and segments as possible in the most effective manner. Similarly, employing “service level optimization” (a variation on inventory optimization that optimizes customer service) can be highly beneficial in maximizing profits. We saw this at a soft drinks manufacturer who’s range of syrup products were used to make fountain drinks at venues such as restaurants and bars. Recognizing the needs of each market channel and customer segment, and optimizing the service policy to each, allowed the company to significantly exceed profitability goals while keeping inventories in check. Low gross margin and high demand variability – Just the opposite of the previous segment, these can be the most challenging supply chains due to the challenge of changing demand streams without much profitability. Here demand shaping activities can work to stabilize demand and hence the supply chain. Promotions and other techniques may serve to shape demand to make it more manageable. A second approach is to try to build agility into the supply chain, allowing it to adapt to the demand variation while still keeping costs in check. High margin and high demand variability – When margins are reasonably high (Lord suggests anything above 20%) and demand variability is the issue, the power of inventory optimization technology really shines. Good inventory optimization software can orchestrate safety stock and other levers to provide the optimized buffers to address the demand variability while not only avoiding added cost, but often reducing excess inventory holdings and overall supply chain cost structure. In this segment, customer service comes not from the forecast, but from inventory. Variable demand, intermittent demand or long tail demand are all served by inventory. It’s all about understanding demand variability and making the right replenishment decisions that balance opportunity with risk. Lord calls this “situational inventory”. Some businesses are very homogeneous and will fit almost exclusively in one of these four quadrants. Others will have a more heterogeneous portfolio of products or even product families requiring multiple approaches. There are different approaches to optimizing inventories and Lord’s research shows that it starts with understanding the inventory and supply chain characteristics of your business.